Pappardelle are flat noodles about one inch wide that are usually served with rich creamy sauces and gravies. In this dish, thinly sliced zucchini stand in for the pasta. Look for young zucchini for the best results. Recipe and photo from The Almond Milk Cookbook* by Alan Roettinger, @2015 The Book Publishing Company. Reprinted by permission. 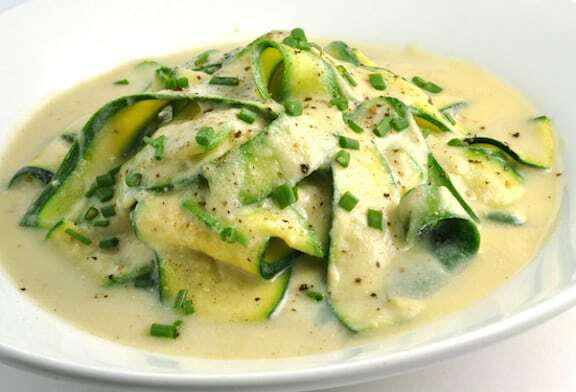 In this creamy side dish, thinly sliced zucchini stand in for pasta. Look for young zucchini for the best results. Combine the oil and onion in a large saucepan over medium heat and stir well. Spread the onion out to evenly cover the bottom of the saucepan. Decrease the heat to low, cover, and cook, stirring occasionally and spreading out the onion again, for 30 minutes. If the onion is sticking, add 1 tablespoon of water. Do not let the onion brown. Add the corn, almond milk, garlic, and salt, and stir to combine. Increase the heat to medium-high and bring to a boil, stirring constantly. Decrease the heat to medium and cook, stirring frequently, until the corn is tender, about 8 minutes. Transfer to a blender and process on high speed until smooth. Return to the saucepan and cook over medium heat, stirring occasionally, until the sauce is thick enough to coat a spoon, about 10 minutes. Add 2 tablespoons of the chives and stir to combine. Fill a large saucepan halfway with water and bring to a boil over high heat. Add the zucchini and cook, stirring occasionally, until just tender, 1 to 2 minutes. Drain well and add to the sauce. Toss gently but thoroughly. Season with salt and pepper and toss again. Garnish with the remaining tablespoon of chives and serve at once. Tip: A mandoline is very helpful for obtaining thin, uniform slices of zucchini. Or, you can also use a vegetable peeler. Here are more recipes for Zucchini and Other Summer Squashes.